British Egyptologist and journalist. Born, Rochester 1886. Killed in action near Loos (between Vermelles and Hulloch), 1915. Foundation Scholar, Marlborough. Won an open scholarship to Exeter College, Oxford in 1905, completing his BA degree in 1909 with a Second Class in both Moderations and Literae Humaniores. Attached to the Department of Antiquities in Egypt, serving under A. E. P. Weigall for seven months in 1909. Assistant master, Fonthill School, East Grinstead, 1910-11. Assistant correspondent for The Times, based in Berlin, 1911-15. Volunteered at the beginning of World War I, as a commissioned officer he was appointed Second Lieutenant in the 6th Battalion of The Buffs (East Kent Regiment), 1915. 1. Not known. Previously in anonymous private possession in England. 2. In the Bodleian Libraries, University of Oxford. 1. Presented by Dr Donald P. Ryan in January 1996. 2. Scans from Bodleian copy and printout made in October-November 2010. 1. 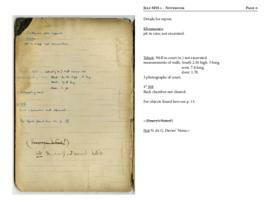 Notebook containing notes on work in Theban tombs, financed by Sir Robert Mond, 1909-1910. 2. 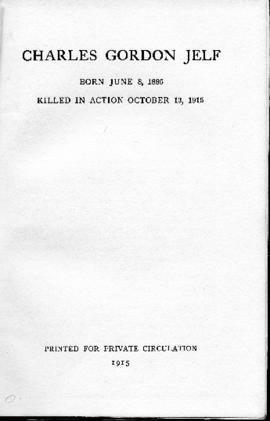 Printout of the booklet "Charles Gordon Jelf. Born June 8, 1886. Killed in Action October 13, 1915" (printed for private circulation, 1915); from Bodleian Libraries, University of Oxford copy [http://solo.bodleian.ox.ac.uk/primo-explore/fulldisplay?docid=oxfaleph013761443&context=L&vid=SOLO&search_scope=LSCOP_OX&tab=local&lang=en_US]. 1-2. Property of the Griffith Institute, University of Oxford. No restrictions. 1. Copyright Griffith Institute, Oxford. 2. Public domain (copyright expired). 1. This is an original. 2. This is a copy. The original publication is in the Bodleian Libraries, University of Oxford. Handwritten paper entitled "The Tomb of Kheruef, Assasif." with plan by Jelf [originally thought to be by A. E. P. Weigall but in the autograph of Jelf] (Gardiner MSS 18.5).